You may be able to visit the moon-crested Lord Ṥiva who dwells in celebration on the bank of the Vāṅmayī river, having ravaged Dakṣa’s sacrifice. Not far from him lives the goddess Bhadrakālī who, mounted on the head of a lion, skewers Dāruka with the sharpened point of her trident. 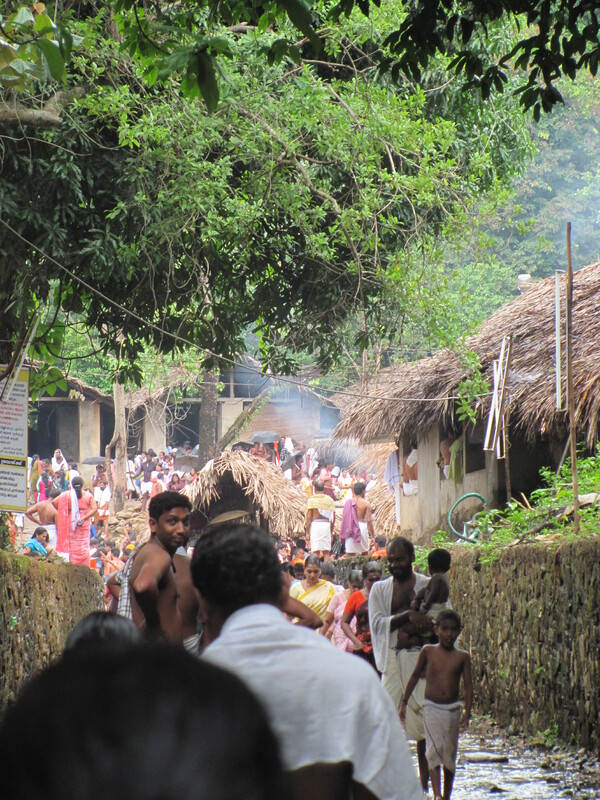 The famous abode of Ṥiva, known today as Kottiyur, is in fact two temples rather than one. This extraordinary spot – which like Thirunelly and Kanchipuram before it on the koel’s route boasts of itself as Dakṣiṇa Kāśī (the Varanasi of the South) – was the scene of the famous Dakṣayāga, the sacrifice conducted by Dakṣa, according to the temple sthālapurāṇa. Dakṣa’s daughter, Satī, had married the penniless, badly (often minimally) dressed ascetic, Ṥiva, against her father’s wishes. Dakṣa decided to organise a grand sacrifice to which he invited everyone except his son-in-law. Satī confronted him at the sacrifice and her father further insulted Ṥiva, publicly humiliating him in his absence. Unable to bear this Satī threw herself into the fire. (As a result her name in its Anglicised form, suttee, came in modern times to refer to the practice of wives self-immolating themselves upon their husband’s funeral pyres.) Ṥiva was incensed both at the insults and his wife’s suicide and summoning up two of his most terrifying forms, Bhadrakālī (the mention of her in the verse refers to the nearby Mukambi temple, where she is worshipped as Porkkali) and Vīrabhadra, and gatecrashed Dakṣa’s ceremony, cutting off his father-in-law’s head in the process. Heaving Satī’s body onto his shoulder he started to dance the tāṇḍava dance and in doing so began to destroy the world. Eventually, Brahma and Viṣṇu managed to stop Ṥiva’s dance, Dakṣa ended up with a replacement head – that of a goat – and mokṣa, and this kṣetra or holy place with its self-formed Ṥivaliṅga was instituted. The temple complex consists of two temples on opposite side of the Vāvalippuḷa or Bavali river – the river Uddaṇḍa calls the Vāṅmayī. One, Ikkare Kuti, is open for 11 months of the year and is much like other temples of this area. The other, Akkare Kuti, opens for the 28 day Vaiśakha festival, which recalls the Dakṣayāga and takes place around May and June each year. Akkare Kuti comprises two piles of stones – Manithara which represents Ṥiva, and Ammarakallu which represents Parvatī – surrounded by a sort of moat made by the Bavali and the Thiruvanchira rivers. 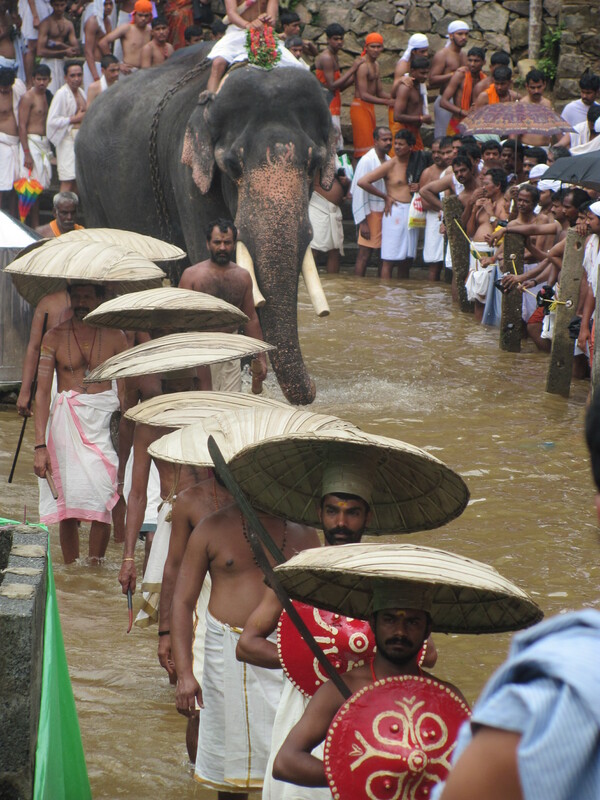 Through the calf-deep water of the moat parade temple elephants and shield-carrying priests. 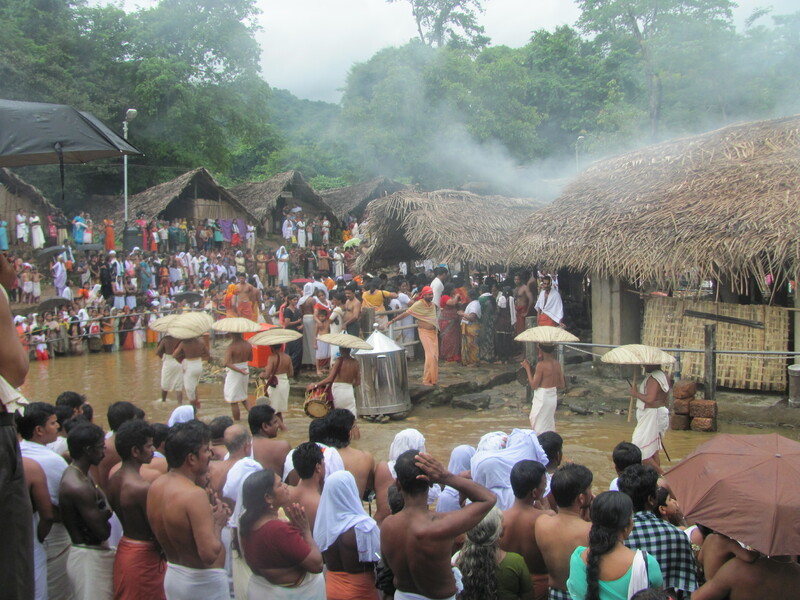 Around the moat, terraced walls, made of mud and stone, rise up to where coconut leaf huts are (re-)built each year to house the police post, the theyyam stage where every evening dancers re-enact the Dakṣa-Ṥiva story, the temple office and so on. Similar temporary huts cover the two deities. A stone-walled channel, through which water courses, connects the temple ground to the river. And everywhere – in the temples, in the moat, on the terraces, in the channel and in the river – throng thousands of devotees, bare-chested men in orange or white dhotis and saried women. The temple trust estimates that between 30-50 lakh people visit the Akkare Kuti temple over these 28 days. The festival was instituted thousands and thousands of years ago – no one can be sure exactly when says the temple trust Chairman – in memory of Dakṣa’s sacrifice and has been practised in exactly the same way ever since. This temporary temple is set up each year because the devotees who originally started worshipping Ṥiva here found it difficult to cross the river every day – in spate it is fairly sizeable although most devotees still attempt the crossing through the river, assisted by sandbags and a spindly bamboo pole, rather than by the nearby footbridge because of the sanctity of the water – so built the Ikkare temple for daily worship. Worship the Lord as you hover in the sky, cooled by the fine spray from the crystal clear waterfalls which will make you look like a swathe of dark cloth studded with pearls. If the temple attendants mistake you for a crow and try to drive you away, sound your call once or twice – a man’s words speak his worth. 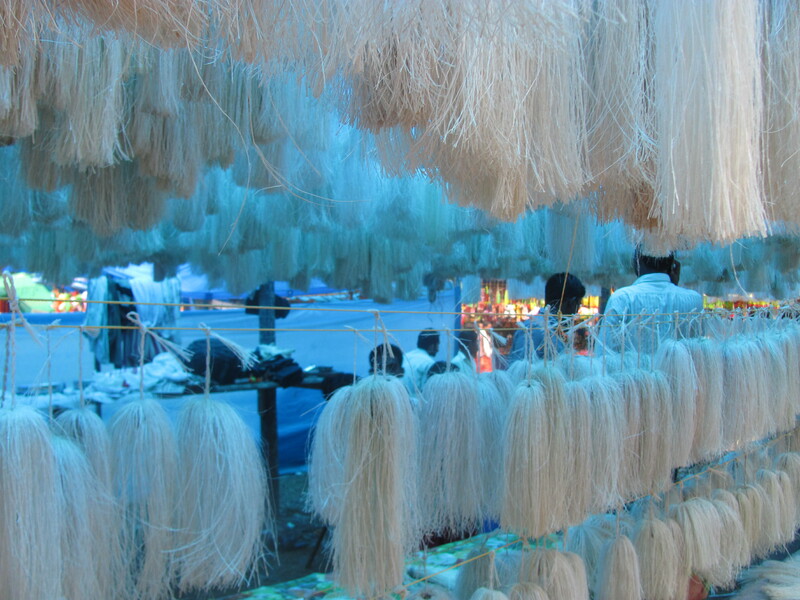 A shop selling the auda or odapoo – lengths of bamboo which are raked into thin hair-like strands – that represent Dakṣa’s white beard. As well as being offered here at the temple, they can are hung in cars and houses throughout the region.